A 40-day feeding trial was conducted to investigate whether feeding a low-protein diet (25%) once daily for either 10 (L10H30) or 20 (L20H20) days then re-feeding a high-protein diet (35%) thrice daily elicit compensatory growth (CG) in genetically improved farmed tilapia (GIFT), Oreochromis niloticus (11.02 ± 0.05 g). 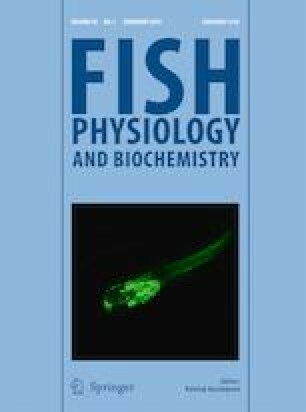 Fish on the control treatment were fed 35% protein diet over 40 days (H40). Fish were stocked into nine 100-L tanks (30 fish per tank) with 3 replicate tanks for each group. Growth performance, feed utilization, proximate composition of body compartment, serum biochemical parameters, and hepatopancreatic histology and expressions of some genes related to inflammatory cytokine were evaluated every 10 days. Growth of L10H30 fish were similar to the control, whereas the weight of L20H20 fish were lower (P < 0.05) at day 20, but this significant difference disappeared at the end of the experiment. During 20–30 days, specific growth rate and feed intake were significantly higher (P < 0.05) and feed efficiency was lower (P < 0.05) in L20H20 fish than those in H40 fish. Dietary manipulations did not affect (P > 0.05) viscerosomatic and hepatosomatic indices, condition factors, serum biochemical parameters, and hepatopancreatic histology. Significant differences (P < 0.05) in proximate composition were observed only in viscera and muscle between L20H20 fish and H40 fish at day 20. The mRNA expressions of heat shock protein 70 kDa, tumor necrosis factor-α and interleukin (IL)-1β were higher (P < 0.05) in L10H30 and L20H20 fish at day 10, while IL-1β mRNA expression was lower (P < 0.05) in L20H20 fish at day 30 than those in H40 fish. Our results indicated that L20H20 fish elicited a complete CG and induced reversible physiological variations in juvenile GIFT. Wei Liu and Xing Lu contributed equally to this work. This work was financially supported by the Agriculture Research System of China [No. CARS–46], National Natural Science Foundation of China [No. 31602178], and Central Public-interest Scientific Institution Basal Research Fund, CAFS [NO. 2018JBF05].